This document provides instructions for installing and configuring the Bare Metal service (ironic) in the overcloud, and using the service to provision and manage physical machines for end users. The Bare Metal service components are also used by the Red Hat OpenStack Platform director, as part of the undercloud, to provision and manage the bare metal nodes that make up the OpenStack environment (the overcloud). For information on how the director uses the Bare Metal service, see Director Installation and Usage. OpenStack Compute (nova) provides scheduling, tenant quotas, IP assignment, and a user-facing API for virtual machine instance management, while the Bare Metal service provides the administrative API for hardware management. OpenStack Identity (keystone) provides request authentication and assists the Bare Metal service in locating other OpenStack services. OpenStack Image service (glance) manages images and image metadata. OpenStack Networking (neutron) provides DHCP and network configuration. OpenStack Object Storage (swift) is used by certain drivers to expose temporary URLs to images. The Bare Metal service uses iPXE to provision physical machines. 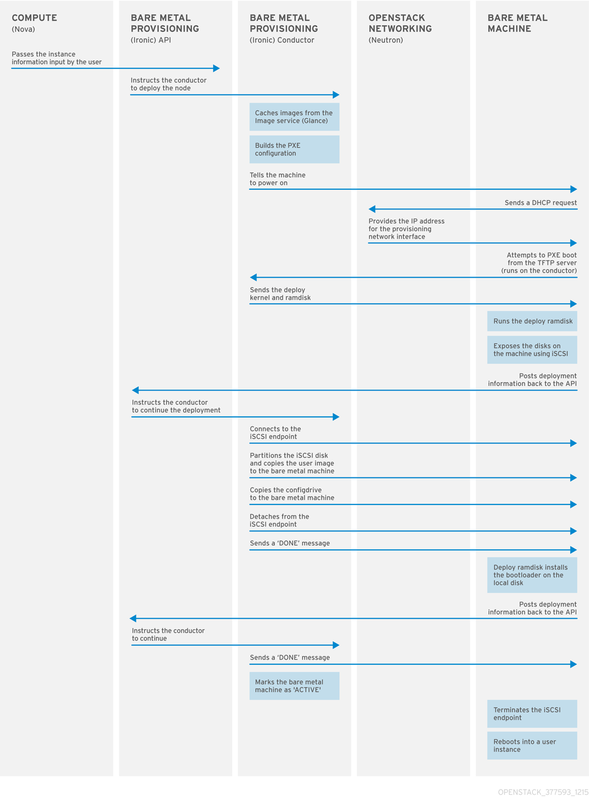 The following diagram outlines how the OpenStack services interact during the provisioning process when a user launches a new machine with the default drivers. This chapter outlines the requirements for configuring the Bare Metal service, including installation assumptions, hardware requirements, and networking requirements. This guide assumes that you have installed the director on the undercloud node, and are ready to install the Bare Metal service along with the rest of the overcloud. For more information on installing the director, see Installing the Undercloud. The Bare Metal service in the overcloud is designed for a trusted tenant environment, as the bare metal nodes have direct access to the control plane network of your OpenStack installation. If you implement a custom composable network for Ironic services in the overcloud, users do not need to access the control plane. The hardware requirements for an overcloud with the Bare Metal service are the same as for the standard overcloud. For more information, see Overcloud Requirements in the Director Installation and Usage guide. The hardware requirements for bare metal machines that will be provisioned vary depending on the operating system you are installing. For Red Hat Enterprise Linux 7, see the Red Hat Enterprise Linux 7 Installation Guide. For Red Hat Enterprise Linux 6, see the Red Hat Enterprise Linux 6 Installation Guide. A NIC to connect to the bare metal network. A power management interface (for example, IPMI) connected to a network reachable from the ironic-conductor service. By default, ironic-conductor runs on all of the controller nodes, unless you are using composable roles and running ironic-conductor elsewhere. PXE boot on the bare metal network. Disable PXE boot on all other NICs in the deployment. 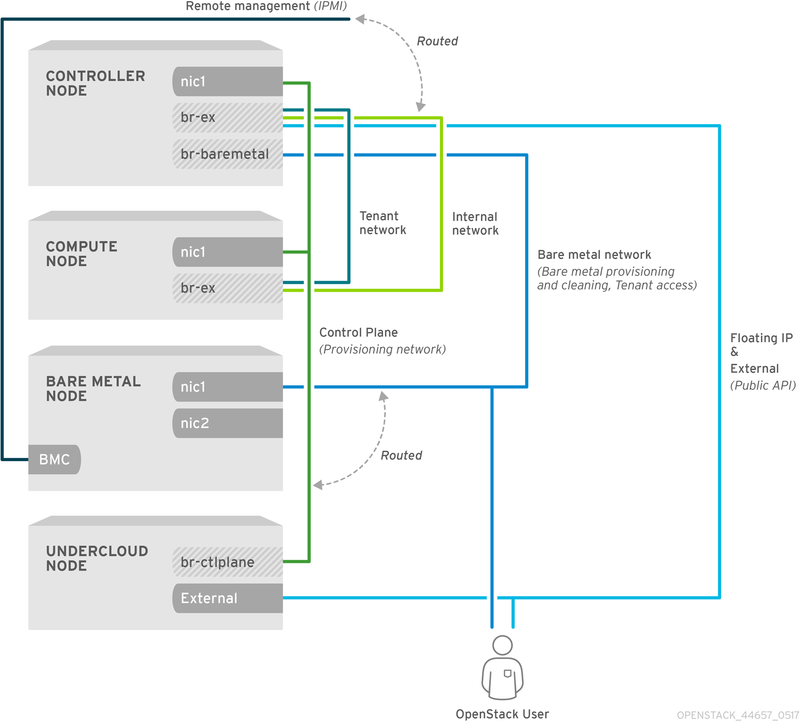 The provisioning and management of bare metal machines on the overcloud. Cleaning bare metal nodes before and between deployments. Tenant access to the bare metal nodes. The bare metal network provides DHCP and PXE boot functions to discover bare metal systems. This network must use a native VLAN on a trunked interface so that the Bare Metal service can serve PXE boot and DHCP requests. Use a flat bare metal network for Ironic Conductor services. This network must route to the Ironic services on the control plane. If you define an isolated bare metal network, the bare metal notes cannot PXE boot. Use a custom composable network to implement Ironic services in the overcloud. The control plane network (the director’s provisioning network) is always untagged. The bare metal network must be untagged for provisioning, and must also have access to the Ironic API. Other networks may be tagged. The controller nodes with the Bare Metal service must have access to the bare metal network. The NIC which the bare metal node is configured to PXE-boot from must have access to the bare metal network. In this architecture, the bare metal network is separated from the control plane network. The bare metal network is a flat network that also acts as the tenant network. The bare metal network is created by the OpenStack operator. This network requires a route to the director provisioning network. Ironic users have access to the public OpenStack APIs, and to the bare metal network. Since the bare metal network is routed to the director’s provisioning network, users also have indirect access to the control plane. Ironic uses the bare metal network for node cleaning. In this architecture, the bare metal network is a custom composable network that does not have access to the control plane. Creating this network might be preferable if you want to limit access to the control plane. The custom composable bare metal network is created by the OpenStack operator. Ironic users have access to the public OpenStack APIs, and to the custom composable bare metal network. For full details about overcloud deployment with the director, see Director Installation and Usage. This chapter covers only the deployment steps specific to ironic. Use an environment file to deploy the overcloud with the Bare Metal service enabled. A template is located on the director node at /usr/share/openstack-tripleo-heat-templates/environments/services/ironic.yaml. Additional configuration can be specified either in the provided template or in an additional yaml file, for example ~/templates/ironic.yaml. For a hybrid deployment with both bare metal and virtual instances, you must add AggregateInstanceExtraSpecsFilter to the list of NovaSchedulerDefaultFilters. If you have not set NovaSchedulerDefaultFilters anywhere, you can do so in ironic.yaml. For an example, see Section 3.3, “Example Templates”. If you are using SR-IOV, NovaSchedulerDefaultFilters is already set in tripleo-heat-templates/environments/neutron-sriov.yaml. Append AggregateInstanceExtraSpecsFilter to this list. The type of cleaning that occurs before and between deployments is set by IronicCleaningDiskErase. By default, this is set to ‘full’ by puppet/services/ironic-conductor.yaml. Setting this to ‘metadata’ can substantially speed up the process, as it cleans only the partition table, however, since the deployment will be less secure in a multi-tenant environment, you should do this only in a trusted tenant environment. You can add drivers with the IronicEnabledDrivers parameter. By default, ipmi, idrac and ilo are enabled. For a full list of configuration parameters, see the Bare Metal section in the Overcloud Parameters guide. You can configure this bridge either in the provisioning network (control plane) of the controllers, so that you can reuse this network as the bare metal network, or add a dedicated network. The configuration requirements are the same, however the bare metal network cannot be VLAN-tagged, as it is used for provisioning. The Bare Metal service in the overcloud is designed for a trusted tenant environment, as the bare metal nodes have direct access to the control plane network of your OpenStack installation. (undercloud) [stack@host01 ~]$ cp /usr/share/openstack-tripleo-heat-templates/network_data.yaml . Update the network_environments.yaml and nic-configs/controller.yaml files to use the new network. (undercloud) [stack@host01 ~]$ cp /usr/share/openstack-tripleo-heat-templates/roles_data.yaml . The following is an example template file. This file might not meet the requirements of your environment. Before using this example, ensure that it does not interfere with any existing configuration in your environment. The AggregateInstanceExtraSpecsFilter allows both virtual and bare metal instances, for a hybrid deployment. Disk cleaning that is done before and between deployments erases only the partition table (metadata). This parameter can contain multiple ranges and works with both spine and leaf. This parameter contains details about the IPA kernel and ramdisk. In most cases, you can use the same images that you use on the undercloud. If you omit this parameter, place alternatives on each controller. Use this parameter to specify the bare metal network interface. To enable the Bare Metal service, include your ironic environment files with the -e option when deploying or redeploying the overcloud, along with the rest of your overcloud configuration. For more information about deploying the overcloud, see Creating the Overcloud with the CLI Tools and Including Environment Files in Overcloud Creation. You can use the OpenStack Integration Test Suite to validate your Red Hat OpenStack deployment. For more information, see the OpenStack Integration Test Suite Guide. This section describes the steps necessary to configure your overcloud after deployment. Use a flat bare metal network for Ironic Conductor services. This network must route to the Ironic services on the control plane network. Follow the procedures in this section to configure OpenStack Networking for a single flat network for provisioning onto bare metal, or to configure a new composable network that does not rely on an unused isolated network or a flat network. The configuration uses the ML2 plug-in and the Open vSwitch agent. Perform all steps in the following procedure on the server that hosts the OpenStack Networking service, while logged in as the root user. Replace NETWORK_NAME with a name for this network. The name of the physical network over which the virtual network is implemented (in this case baremetal) was set earlier in the ~/templates/network-environment.yaml file, with the parameter NeutronBridgeMappings. Replace NETWORK_NAME with the name of the provisioning network that you created in the previous step. Replace NETWORK_CIDR with the Classless Inter-Domain Routing (CIDR) representation of the block of IP addresses that the subnet represents. The block of IP addresses specified by the range starting with START_IP and ending with END_IP must fall within the block of IP addresses specified by NETWORK_CIDR. Replace GATEWAY_IP with the IP address or host name of the router interface that acts as the gateway for the new subnet. This address must be within the block of IP addresses specified by NETWORK_CIDR, but outside of the block of IP addresses specified by the range starting with START_IP and ending with END_IP. Replace ROUTER_NAME with the name of your router, and replace NETWORK with the ID or name of the network that you created previously. Replace ROUTER_NAME with the name of your router and BAREMETAL_SUBNET with the ID or name of the subnet that you created previously. This allows the metadata requests from cloud-init to be served and the node configured. Create a vlan network with a VlanID that matches the OcProvisioning network that you create during deployment. Name the new network provisioning to match the default name of the cleaning network. By default, the Bare Metal service is set to use a network named provisioning for node cleaning. However, network names are not unique in OpenStack Networking, so it is possible for a tenant to create a network with the same name, causing a conflict with the Bare Metal service. Therefore, it is recommended to use the network UUID instead. Replace UUID with the UUID of the bare metal network that you create in the previous steps. You must perform this configuration after the initial overcloud deployment, because the UUID for the network is not available beforehand. Apply the changes by redeploying the overcloud with the openstack overcloud deploy command as described in Section 3.5, “Deploying the Overcloud”. Redeploying the overcloud with openstack overcloud deploy reverts any manual changes, so ensure that you have added the cleaning configuration to ~/templates/ironic.yaml (described in the previous step) before you next use the openstack overcloud deploy command. To initiate node cleaning manually, the node must be in the manageable state. Metadata only clean - Removes partitions from all disks on a given node. This is a faster clean cycle, but less secure since it erases only partition tables. Use this mode only on trusted tenant environments. Full clean - Removes all data from all disks, using either ATA secure erase or by shredding. This can take several hours to complete. Replace UUID with the UUID of the node that you want to clean. After a successful cleaning, the node state returns to manageable. If the state is clean failed, inspect the last_error field for the cause of failure. You must create a flavor to use as a part of the deployment. The specifications (memory, CPU, and disk) of this flavor must be equal to or less than the hardware specifications of your bare metal node. Replace RAM with the amount of memory, VCPU with the number of vCPUs and DISK with the disk storage value. The property baremetal is used to distinguish bare metal from virtual instances. The deploy image is used by the Bare Metal service to boot the bare metal node and copy a user image onto the bare metal node. The deploy image consists of the kernel image and the ramdisk image. The user image is the image deployed onto the bare metal node. The user image also has a kernel image and ramdisk image, but additionally, the user image contains a main image. The main image is either a root partition, or a whole-disk image. A whole-disk image is an image that contains the partition table and boot loader. The Bare Metal service does not control the subsequent reboot of a node deployed with a whole-disk image as the node supports localboot. A root partition image contains only the root partition of the operating system. If you use a root partition, after the deploy image is loaded into the Image service, you can set the deploy image as the node boot image in the node properties. A subsequent reboot of the node uses netboot to pull down the user image. The examples in this section use a root partition image to provision bare metal nodes. These images are often in the home directory, unless you have deleted them, or unpacked them elsewhere. If they are not in the home directory, and you still have the rhosp-director-images-ipa package installed, these images are in the /usr/share/rhosp-director-images/ironic-python-agent*.tar file. The final image that you need is the user image that will be deployed on the bare metal node. User images also have a kernel and ramdisk, along with a main image. To download and install these packages, you must first configure whole disk image environment variables to suit your requirements. As a part of the disk image building process, the director requires a base image and registration details to obtain packages for the new overcloud image. Define these attributes with the following Linux environment variables. Sets the local image that you want to use as the basis for your whole disk image. Use an activation key instead of login details as part of the registration process. Defines whether to attach the most compatible subscription automatically. The base URL of the content delivery server containing packages for the image. The default Customer Portal Subscription Management process uses https://cdn.redhat.com. If you use a Red Hat Satellite 6 server, set this parameter to the base URL of your Satellite server. The organization where you want to register the images. Gives the password for the user account that registers the image. A comma-separated string of repository names. Each repository in this string is enabled through subscription-manager. Gives the hostname of the subscription service to use. The default is for the Red Hat Customer Portal at subscription.rhn.redhat.com. If using a Red Hat Satellite 6 server, set this parameter to the hostname of your Satellite server. Gives the user name for the account that registers the image. Download the Red Hat Enterprise Linux KVM guest image from the Customer Portal (requires login). This command extracts the kernel as rhel-image.vmlinuz and initial ramdisk as rhel-image.initrd. Deploy interfaces have a critical role in the provisioning process. Deploy interfaces orchestrate the deployment and define the mechanism for transferring the image to the target disk. Dependent packages configured on the bare metal service nodes that run ironic-conductor. OpenStack Compute (nova) must be configured to use the bare metal service endpoint. Flavors must be created for the available hardware, and nova must boot the new node from the correct flavor. Hardware to enroll with the Ironic API service. The Nova scheduler receives a boot instance request from the Nova API. The Nova scheduler identifies the relevant hypervisor and identifies the target physical node. The Nova compute manager claims the resources of the selected hypervisor. The Nova compute manager creates unbound tenant virtual interfaces (VIFs) in the Networking service according to the network interfaces that the nova boot request specifies. Nova compute invokes driver.spawn from the Nova compute virt layer to create a spawn task that contains all of the necessary information. During the spawn process, the virt driver completes the following steps. Updates the target ironic node with information about the deploy image, instance UUID, requested capabilities, and flavor propertires. Calls the ironic API to validate the power and deploy interfaces of the target node. Attaches the VIFs to the node. Each neutron port can be attached to any ironic port or group. Port groups have higher priority than ports. The Nova ironic virt driver issues a deploy request with the Ironic API to the Ironic conductor that services the bare metal node. Virtual interfaces are plugged in and the Neutron API updates DHCP to configure PXE/TFTP options. The ironic node boot interface prepares (i)PXE configuration and caches the deploy kernel and ramdisk. The ironic node management interface issues commands to enable network boot of the node. The ironic node deploy interface caches the instance image, kernel, and ramdisk, if necessary. The ironic node power interface instructs the node to power on. With iSCSI deployment, the conductor copies the image over iSCSI to the physical node. With direct deployment, the deploy ramdisk downloads the image from a temporary URL. This URL must be a Swift API compatible object store or a HTTP URL. The node boot interface switches PXE configuration to refer to instance images and instructs the ramdisk agent to soft power off the node. If the soft power off fails, the bare metal node is powered off with IPMI/BMC. The deploy interface instructs the network interface to remove any provisioning ports, binds the tenant ports to the node, and powers the node on. The provisioning state of the new bare metal node is now active. The iSCSI deploy interface is the default deploy interface. However, you can enable the direct deploy interface to download an image from a HTTP location to the target disk. Your overcloud node memory tmpfs must have at least 6GB of RAM. Create or modify a custom environment file /home/stack/undercloud_custom_env.yaml and specify the IronicDefaultDeployInterface. Include the custom environment file in DEFAULT section of the undercloud.conf file. Prepare an inventory file with the node details, import the file into the Bare Metal service, and make the nodes available. Register a physical machine as a bare metal node, then manually add its hardware details and create ports for each of its Ethernet MAC addresses. These steps can be performed on any node which has your overcloudrc file. Both methods are detailed in this section. After enrolling the physical machines, Compute is not immediately notified of new resources, because Compute’s resource tracker synchronizes periodically. Changes will be visible after the next periodic task is run. This value, scheduler_driver_task_period, can be updated in /etc/nova/nova.conf. The default period is 60 seconds. Create a file overcloud-nodes.yaml, including the node details. You can enroll multiple nodes with one file. <IPMI_IP> with the address of the Bare Metal controller. <CPU_COUNT> with the number of CPUs. <CPU_ARCHITECTURE> with the type of architecture of the CPUs. <MEMORY> with the amount of memory in MiB. <ROOT_DISK> with the size of the root disk in GiB. <MAC_ADDRESS> with the MAC address of the NIC used to PXE boot. You must include root_device only if the machine has multiple disks. Replace <SERIAL> with the serial number of the disk that you want to use for deployment. The nodes are now in the enroll state. There may be a delay between enrolling a node and its state being shown. To create a node, you must specify the driver name. This example uses ipmi. To use a different driver, you must enable the driver by setting the IronicEnabledDrivers parameter. For more information on supported drivers, see Appendix A, Bare Metal Drivers. Replace CPU with the number of CPUs. Replace RAM_MB with the RAM (in MB). Replace DISK_GB with the disk size (in GB). Replace ARCH with the architecture type. Replace NODE_UUID with the unique identifier for the node. Replace MAC_ADDRESS with the MAC address of the NIC used to PXE boot. If you have multiple disks, set the root device hints. This informs the deploy ramdisk which disk it should use for deployment. name (String): The name of the device, for example: /dev/sdb1 Use this property only for devices with persistent names. If you specify more than one property, the device must match all of those properties. Replace NODE_UUID with the unique identifier for the node. Alternatively, use the node’s logical name. The output of the openstack baremetal node validate command should report either True or None for each interface. Interfaces marked None are those that you have not configured, or those that are not supported for your driver. Interfaces may fail validation due to missing 'ramdisk', 'kernel', and 'image_source' parameters. This result is fine, because the Compute service populates those missing parameters at the beginning of the deployment process. OpenStack Compute uses host aggregates to partition availability zones, and group together nodes with specific shared properties. When an instance is provisioned, Compute’s scheduler compares properties on the flavor with the properties assigned to host aggregates, and ensures that the instance is provisioned in the correct aggregate and on the correct host: either on a physical machine or as a virtual machine. Add the property baremetal to your flavors, setting it to either true or false. Create separate host aggregates for bare metal hosts and compute nodes with a matching baremetal property. Nodes grouped into an aggregate inherit this property. Set the baremetal property to true on the baremetal flavor. Set the baremetal property to false on the flavors used for virtual instances. If you have created a composable role with the NovaIronic service, add all the nodes with this service to the baremetal-hosts aggregate. By default, only the controller nodes have the NovaIronic service. This chapter describes how to provision a physical machine on an enrolled bare metal node. Instances can be launched either from the command line or from the OpenStack dashboard. Use the openstack command line interface to deploy a bare metal instance. Replace NETWORK_UUID with the unique identifier for the network that was created for use with the Bare Metal service. To assign the instance to a security group, include --security-group SECURITY_GROUP, replacing SECURITY_GROUP with the name of the security group. Repeat this option to add the instance to multiple groups. For more information on security group management, see the Users and Identity Management Guide. Log in to the dashboard at http[s]://DASHBOARD_IP/dashboard. In the Details tab, specify the Instance Name and select 1 for Count. In the Source tab, select an Image from Select Boot Source, then click the + (plus) symbol to select an operating system disk image. The chosen image moves to Allocated. In the Flavor tab, select baremetal. In the Networks tab, use the + (plus) and - (minus) buttons to move required networks from Available to Allocated. Ensure that the shared network created for the Bare Metal service is selected here. If you want to assign the instance to a security group, in the Security Groups tab, use the arrow to move the group to Allocated. Port group functionality for bare metal nodes is available in this release as a Technology Preview, and therefore is not fully supported by Red Hat. It should be used only for testing, and should not be deployed in a production environment. For more information about Technology Preview features, see Scope of Coverage Details. Port groups (bonds) provide a method to aggregate multiple network interfaces into a single ‘bonded’ interface. Port group configuration always takes precedence over an individual port configuration. If a port group has a physical network, then all the ports in that port group should have the same physical network. The Bare Metal Provisioning service supports configuration of port groups in the instances using configdrive. Bare Metal Provisioning service API version 1.26 supports port group configuration. To configure port groups in a Bare Metal Provisioning deployment, you must configure the port groups on the switches manually. You must ensure that the mode and properties on the switch correspond to the mode and properties on the bare metal side as the naming can vary on the switch. You cannot use port groups for provisioning and cleaning if you need to boot a deployment using iPXE. Port group fallback allows all the ports in a port group to fallback to individual switch ports when a connection fails. Based on whether a switch supports port group fallback or not, you can use the ``--support-standalone-ports`` and ``--unsupport-standalone-ports`` options. Create a port group by specifying the node to which it belongs, its name, address, mode, properties and whether it supports fallback to standalone ports. You can also update a port group using the openstack baremetal port group set command. If you do not specify an address, the deployed instance port group address is the same as the OpenStack Networking port. The port group will not be configured if the neutron port is not attached. During interface attachment, port groups have a higher priority than the ports, so they are used first. Currently, it is not possible to specify whether a port group or a port is desired in an interface attachment request. Port groups that do not have any ports will be ignored. Port groups must be configured manually in standalone mode either in the image or by generating the configdrive and adding it to the node’s instance_info. Ensure that you have cloud-init version 0.7.7 or later for the port group configuration to work. Boot an instance by providing an image that has cloud-init or supports bonding. Here, X is a number autogenerated by cloud-init for each configured port group, starting with a 0 and incremented by one for each configured port group. Use the following commands to determine which IP addresses are assigned to which host and also to which bare metal node. This feature allows you to know the host to IP mapping from the undercloud without needing to access the hosts directly. The Bare Metal Provisioning service has an API to manage the mapping between virtual network interfaces, for example, the ones used in the OpenStack Networking service and the physical interfaces (NICs). These interfaces are configurable for each Bare Metal Provisioning node, allowing you to set the virtual network interface (VIF) to physical network interface (PIF) mapping logic using the openstack baremetal node vif* commands. The following example procedure describes the steps to attach and detach VIFs. After the VIF is attached, the Bare Metal service updates the virtual port in the OpenStack Networking service with the actual MAC address of the physical port. After detaching or attaching interfaces, the bare metal OS removes, adds, or modifies the network interfaces that have changed. When you replace a port, a DHCP request obtains the new IP address, but this may take some time since the old DHCP lease is still valid. The simplest way to initiate these changes immediately is to reboot the bare metal host. You can configure the bare metal service to display notifications for different events that occur within the service. These notifications can be used by external services for billing purposes, monitoring a data store, and so on. This section describes how to enable these notifications. To enable notifications for the baremetal service, you must set the following options in your ironic.conf configuration file. The notification_level option in the [DEFAULT] section determines the minimum priority level for which notifications are sent. The values for this option can be set to debug, info, warning, error, or critical. If the option is set to warning, all notifications with priority level warning, error, or critical are sent, but not notifications with priority level debug or info. If this option is not set, no notifications are sent. The priority level of each available notification is documented below. The transport_url option in the [oslo_messaging_notifications] section determines the message bus used when sending notifications. If this is not set, the default transport used for RPC is used. All notifications are emitted on the ironic_versioned_notifications topic in the message bus. Generally, each type of message that traverses the message bus is associated with a topic that describes the contents of the message. The notifications can be lost and there is no guarantee that a notification will make it across the message bus to the end user. Ironic has a string field fault that records power, cleaning, and rescue abort failures for nodes. The node is in maintenance mode due to power sync failures that exceed the maximum number of retries. The node is in maintenance mode due to the failure of a cleaning operation. The node is in maintenance mode due to the failure of a cleaning operation during rescue abort. There is no fault present. Conductor checks the value of this field periodically. If the conductor detects a power failure state and can successfully restore power to the node, the node is removed from maintenance mode and restored to operation. If the operator places a node in maintenance mode manually, the conductor does not automatically remove the node from maintenance mode. To disable automatic power fault recovery, set the value to 0. You can perform introspection of Overcloud nodes to monitor the specification of the nodes. Replace <NODENAME> with the name of the node that you want to inspect. Replace <NODENAME> with the name of the node. Heat is used to create the instances, including the required network. When the instances are ready (openstack server list will be ACTIVE), sahara connects to each node and applies the configuration for the specified big data plugin. This can include installing additional software, spawning services, and other tasks, until the big data instance is ready. Use the default parameters when deploying Bare Metal Provisioning (ironic) and Data Processing (sahara) on the overcloud. All the bare metal nodes must be grouped under a predefined flavor (referred to in this section as the baremetal_flavor). Mixed configurations combining virtual and bare metal nodes have not been tested, and may not be supported. Typically, virtual instances are connected to a private project network and are accessible through a floating IP pool on a public network. However, an issue could arise if the bare metal machines managed by ironic are accessible only through a single network. As a result, the sahara cluster should be configured not to use a floating IP address pool, but to use only that network. This issue is not limited to bare metal nodes, and could also arise when sahara is used with virtual machines only. You may need to generate new images for the bare metal nodes using sahara-image-elements (including the additional baremetal switch). If so, you must also generate the kernel and initrd images. However, you may not need to generate the bare metal images at all, as the images typically generated by sahara-image-elements do work as full-disk images. The bare metal images may be needed for the MapR plugin, because the flavor requires an ephemeral disk and that further requires a partition image. There is currently a known issue for the generation script that prevents the creation of bare metal images. This is expected to be resolved in a future update. Once the images are generated, you must upload the images to glance, and then register the images in sahara. Enable dfs_replication by setting it to 1. Set the flavor to baremetal_flavor. Create a cluster: The resulting cluster should initialize successfully, and the instances you deploy should use the bare metal nodes. The following sections contain information and steps that may be useful for diagnosing issues in a setup with the Bare Metal service enabled. The default template is pxe_config.template, so it is easy to omit the i and inadvertently turn this into ipxe_config.template. To fix this issue, verify the PXE Boot Configuration file in the /httpboot/pxelinux.cfg/MAC_ADDRESS on the Compute or Bare Metal service node and ensure that all the IP addresses listed in this file correspond to IP addresses on the Bare Metal network. The only network the Bare Metal service node knows about is the Bare Metal network. If one of the endpoints is not on the network, the endpoint cannot reach the Bare Metal service node as a part of the boot process. Parameter http_url in /etc/ironic/ironic.conf file. This IP address must be on the Bare Metal network. Parameter api_url in /etc/ironic/ironic.conf file. This IP address must be on the Bare Metal network. The IPMI Driver in use by the Bare Metal service for this node. If the Bare Metal service is not getting the right hostname, it means that cloud-init is failing. To fix this, connect the Bare Metal subnet to a router in the OpenStack Networking service. The requests to the meta-data agent should now be routed correctly. If you are having trouble authenticating to the Identity service, check the identity_uri parameter in the ironic.conf file and ensure that you remove the /v2.0 from the keystone AdminURL. For example, set the identity_uri to http://IP:PORT. If the Compute scheduler cannot find a suitable Bare Metal node on which to boot an instance, a NoValidHost error can be seen in /var/log/nova/nova-conductor.log or immediately upon launch failure in the dashboard. This is usually caused by a mismatch between the resources Compute expects and the resources the Bare Metal node provides. The resources reported here should match the resources that the Bare Metal nodes provide. A bare metal node can be configured to use one of the drivers enabled in the Bare Metal service. Each driver is made up of a provisioning method and a power management type. Some drivers require additional configuration. Each driver described in this section uses PXE for provisioning; drivers are listed by their power management type. You can add drivers with the IronicEnabledHardwareTypes parameter in your ironic.yaml file. By default, ipmi, redfish, idrac and ilo are enabled. For the full list of supported plug-ins and drivers, see Component, Plug-In, and Driver Support in Red Hat OpenStack Platform. redfish_username - The Redfish username. redfish_password - The Redfish password. redfish_address - The IP address of the Redfish controller. redfish_system_id - The canonical path to the system resource. This path should include the root service, version, and the path/unqiue ID for the system. For example: /redfish/v1/Systems/CX34R87. redfish_verify_ca - Either a Boolean value, a path to a CA_BUNDLE file, or a directory with certificates of trusted CAs. If set to True the driver verifies the host certificates. If False the driver ignores verifying the SSL certificate. If set to a path, the driver uses the specified certificate or one of the certificates in the directory. Defaults to True. Red Hat OpenStack Platform now uses next generation drivers, also known as hardware types, that replace older drivers. In OpenStack Platform 14, these older drivers have been removed and are no longer accessible. You must change to hardware types before upgrading to OpenStack Platform 14. Ensure that you include all environment and data files relevant to your overcloud.